The author who scared us out of the water with Jaws invites us into the White House - with laughter! Q Clearance is a stunning departure for the author of Jaws, The Deep, and The Girl of the Sea of Cortez - a comic masterpiece of cold war misunderstanding. The trouble all begins when Timothy Burnham, an anxiety-ridden presidential speechwriter, is suddenly given "Q Clearance"--- privileged access to top-secret atomic information. Burnham is an ordinary guy, with a carefully cultivated low profile. But along with "Q Clearance" comes what for Burnham is an utter catastrophe ---something called power. The real thing, in a town where power matters most. Burnham is given his own paper shredder. He is overwhelmed with important, unintelligible documents. And most bewildering of all, he is singled out by the President of the United States as the one man who speaks The Truth. Losing ground fast in a power game he never watned to play, Burnham unwittingly, inevitably becomes the target of Soviet spies. While Q Clearance mostly pokes fun, it is also about the thin line that can exist between right and wrong, and the dangers of isolation, power and fear. With the strong characters and dramatic action that have won him millions of readers, here is Peter Benchley at his best. What's new is the high comedy, which bursts full-blown onto the fiction scene to the delight of all who have waited for the grandson of Robert Benchley to find his own comic voice. Peter Benchley belongs to one of America's most celebrated literary families: his grandfather was the humorist Robert Benchley, and his father was the novelist Nathaniel Benchley. 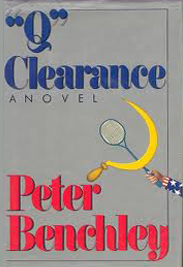 Peter began writing at the age of fifteen, and after graduating from Harvard wrote for the Washington Post and Newsweek. He worked as a speechwriter for Lyndon Johnson before publishing his first novel, Jaws. His articles have been published in the National Geographic, The New Yorker, the New York Times Magazine, and other publications.